The countertop is an essential component of the kitchen. It is where all the action takes place. But more than that, the countertop is the foundation of kitchen décor when doing a kitchen renovation. It bares the burden of setting the tone and feel of the space. Seeing its importance in kitchen décor, it matters a lot what material, finish and design you choose for your countertop. We have put together the hottest countertop trends for 2018 that will give you ideas for your own kitchen. As you would expect, these trends focus heavily on color and material choices. Spoiler alert: quartz is still king of kitchen countertops. Quartz was introduced as a high-end alternative to granite, check out our granite vs quartz article. 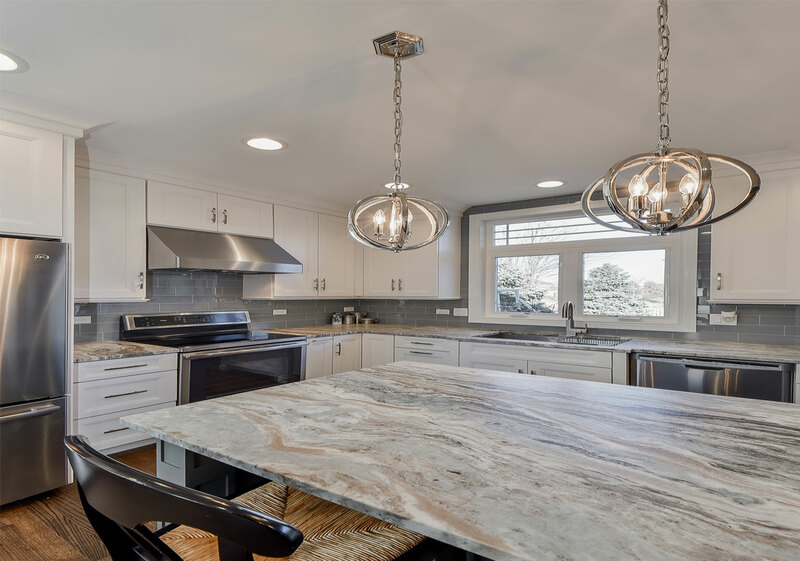 Granite a natural rock, has for years dominated the countertop scene especially for homeowners who want something strong, durable and good looking. But it has a downside–it is porous. This means that liquids like water, wine, and oils can seep through the surface causing staining. Even worse, it encourages the breeding of dangerous bacteria that could leave your countertop unsanitary. The porous issue can be resolved by sealing the granite surface with a non-porous sealant. But the sealant wears off with time & wear, so the countertop has to be resealed throughout its lifetime. Quartz, on the other hand, is non-porous and does not have to go through regular re-sealing. This means it is highly resistant against staining and is one of the most hygienic countertop options for homeowners. Add to that the fact that quartz is extremely strong, making it super durable and you can see why this low maintenance material is not going anywhere soon as the countertop material of choice for many homeowners. Quartz now comes in many colors, patterns, and finishing techniques that mimic’s the look of natural stone. One of the most current and trending finishes right now is matte. In 2019, Quartz manufacturers will continue to impress us with manufacturing improvements to keep this countertops option king. Not just for this year, but for quite some time to come. Since we have been experiencing a design movement using more textured and tactile surfaces, why not consider it in countertops too. Honed and leather surfaces are the most common and can be applied to many different materials, such as granite, marble, and quartz. Even though polished is still the most popular, there are advantages to these two others. Honed finish is a matte finish with little to no shine. The overall look will vary depending on the stone type, but it should have a low sheen and a smooth surface. Honed finishes work well with marble, since it’s lack of shine conceals any flaws or scratch marks more readily. Leathered finish is a newer style of treatment that has become more popular in recent years. It has a soft sheen, that is less glossy from a polished slab, and to the touch has a different feel. The leather finish retains the stone’s natural color giving it a more sophisticated look than honed. 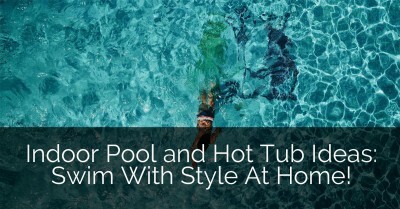 It also hides fingerprints and water spots remarkable well, which is very appealing to many. These are just a few finishes to consider when choosing a countertop in 2018. Homeowners are seeking a bit more character in their countertops. Thankfully, technology is there to offer creative solutions. Today, countertops come in a wide variety of patterns unlike the plain styles of years past. Say goodbye to the round particulates of countertops past and hello to realistic veining. Materials like quartz are being designed to resemble slabs of natural stone, like granite & marble. This involves creating veins in interesting patterns swirled into the countertop slabs. This added boost to your creative personality in your kitchen will wow. Want something even more realistic; then no need for a polished piece–honed and leathered finishes have the durability needed for the kitchen but have a drastically different look in the space. These varied finishes make for an interesting matchup with other kitchen elements including the flooring, walls, cabinetry, and backsplash. It also adds a twist to your cooking, creating a nice visual background for the multitude of kitchen activities. The countertop is getting the modern treatment and the sinks are not being left behind. Last year home owners couldn’t get enough of integrated sinks, however, those days are behind us. 2019 is bringing different finishing’s, sizes, and styles to kitchen sinks and we’re super excited about it.This year we’re seeing matte black sinks and sink fixtures as well as gold and brass colors take over. These finishes stray away from your typical silver metal sinks. 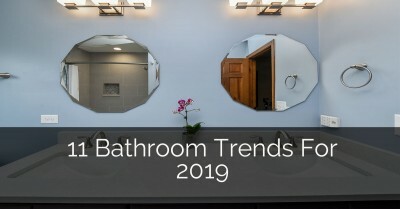 These are also popular faucet color choices foe 2019 bathroom trends! Oversized sinks are also gaining popularity this year. This is great in terms of functionality. Oversized sinks pair lovely with an oversized fridge! As the kitchen area continues to expand in area and accessibility, it only makes sense that it’s appliances do as well. Elegant and modern styles of sinks are also coming in hot this year and will be highly sought after. For example, farmhouse sinks, otherwise known as apron front sinks are super trendy. Expect to see all these types of sinks as part of 2019 kitchen countertop trends. Preference for soft neutral tones is a common theme running throughout the home in upcoming décor trends. The bright bold hues of Art Deco and mid-century styles are gradually losing place in the kitchen in favor of more laid back tones. Instead of a bright blue or jet black countertop; you are more likely to find soft grey, white and beige tones in kitchens in 2018. There is more focus on highlighting captivating individual components using neutral backgrounds. So you might find a beige (or the new greige – grey + beige) countertop, with a ceiling-high mosaic pattern backsplash standing out against it. Homeowners might also experiment with other tones, though still maintaining the overall neutral style. Some of these slightly different quartz colors include dull browns and light blues (almost gray). 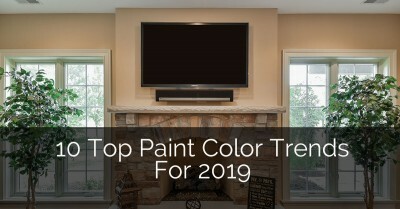 Other than that, more and more homeowners are opting to stick to off-whites, ashy grays, and neutral beige. Interestingly, this shift to neutral tones comes at a time when kitchens are opening up to natural lighting. Super large windows, skylights and folding glass door wall systems are getting more common in kitchens. The result is an enhanced bright and airy feel that shouts modern. At a time when small spaces are getting popular, the combined effect of natural light and neutral tones really helps in expanding perceived space. Backsplashes can be a fun part of the house to decorate as there always seems to be new trends and styles. With all the constant change, who can keep up? We are here to help, with your guide to 2019 backsplash trends and styles. Basic subways tiles are out! Okay maybe not completely, but if homeowners are using them these days, then they are using larger ones. Or even patterned ones! People are moving on to larger slabs of tiles and tiles with various textures or patterns. The color choices are endless here. It just depends on the other colors you choose in your kitchen and of course personal taste. A pop of color would be very trendy right now and allows you to get more creative with your design. Neutral patterns with natural texture is another option for those looking for a classic look. Another big change we’re seeing in tile backsplashes are their size and the portion of wall they are covering. Large slabs are taking over. These slabs can be marble, quartz, wood, copper, stainless steel, glass…. the list goes on forever! Regarding wall coverage, backsplashes are rising to the ceiling. With upper cabinets on their way out, homeowners are left with more wall space. When it comes to decorating this space, tile backsplashes are a popular choice. The countertop has always been a big part of kitchen décor. Through the generations, we have gone from style to style as homeowners seek the perfect look for their main cooking space. In modern times, variety is the theme of the day. Homeowners have an almost endless selection of materials, styles, sizes, and finishes to choose from. For now, laid back countertops seem to be winning. The modern kitchen in 2018 will feature neutral colored countertops with thin “delicate” slabs and sleek integrated sinks. By all indications, it seems these trends will extend even beyond 2018. It’s helpful tips for Kitchen cabinets. step by step clear kitchen countertop design. Wow! Top 6 trends in kitchen countertop design for 2017. The countertop is an essential component of the kitchen. But more than that, the countertop is the bedrock of kitchen décor when doing a kitchen renovation. It bears the burden of setting the tone and feel of the space. Thanks for sharing. These designs are great. I love the wooden like design. You have given very good information about kitchen countertops design. We can use them according to our needs. Please also post some information for granite countertops and marble countertops. Keep up the great work. Thank you! I’ve been searching all over and finally found what i was looking for in your article! Hope that helps, let us know if you need anything else! I would suggest pulling a color from the Summerhill slab. There are lots to choose from. If you are leaning towards grey and a subtler color palette, then Greystone or Dunmore would be a nice compliment. If you wanted more of an impact, then the darker Menai would be my pick. If they want something with a pattern, I would make sure that they are different sizes… maybe something smaller. Like Newport or Queen Anne. I even like Brittanicca too. Hi What are the top Granite kitchen countertops colors in 2017 that matches mosaic backsplash grey/beige/white..! Unfortunately because granite choices are so different from each supplier, it would be very difficult to share some names with you. My advice would be bring your tile with you to the granite fabricator you are looking to work with and try to match it. Bryan I am so grateful for your assistance. Your response is so helpful and you were so detailed. I am interested in finding the name of the quartz pictured in your article under #1 Quartz is here to stay. That image is actually granite (Silver Stratus) and has been replaced with an image of quartz (Cambria Torquay). Thanks for this informative article. I wanted to replace our old countertop. I am now looking up some countertops that fit my kitchen design. I fell in love with Silestone Charcoal Grey Soapstone. But, I have been nervous about using it for our new kitchen with white cabinets and white subway tile. Based on this article it sounds that a white quartz selection may be a better choice. I wouldn’t be nervous about using the Silestone Charcoal Soapstone. It’s beautiful and the soapstone pattern & colors are becoming more popular. You will be cutting edge. But the best way to determine the color of your countertops, is to ask yourself what you want the overall feeling of the space to be. Light, airy, & subtle? Or more drama with a bold contrast? That will tell you what countertop to use. Good luck with your kitchen and either way, it’s going to look beautiful. Thanks for sharing. I must bookmark it! Hi Bryan, Fantastic article. 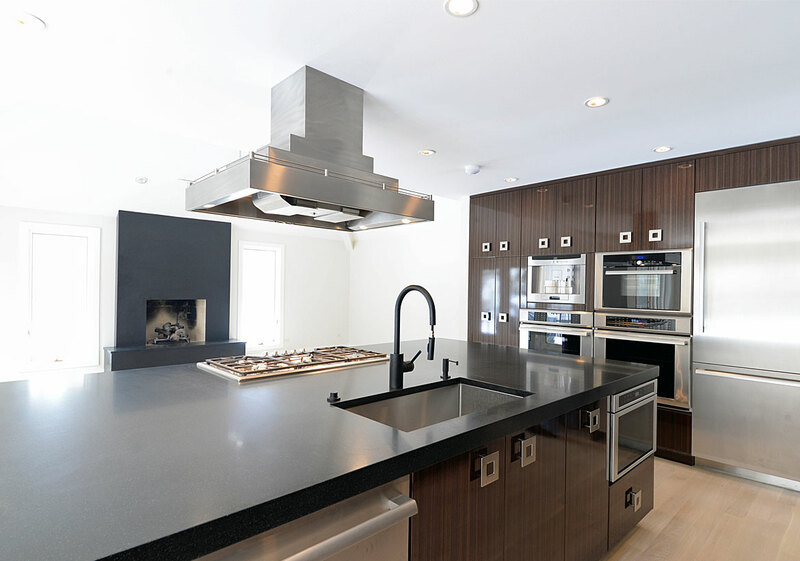 Like Susan above, I just picked out the Silestone Charcoal Soapstone quartz countertops in a polished finish. I have off white cabinets (that are not new) and I’m looking for a backsplash that stands out. I was thinking of a cement tile look with the bold prints and patterns. What’s your opinion on that, any suggestions on patterns or colors? Thank you. If you are looking to make an impact, then I think using the cement tiles with patterns is a great way to achieve that. But I wouldn’t rule out some pretty porcelain versions as well. My only cautionary note to you would be to watch the overall pattern size. Some of them can get quite large. Since I don’t know your kitchen layout, I’m assuming you have the standard 18” backsplash space (between countertops & wall cabinets). You don’t want to get a pattern too large that you can’t see the overall design or affect. It’s hard for me to recommend a tile/pattern, since I haven’t seen the space. 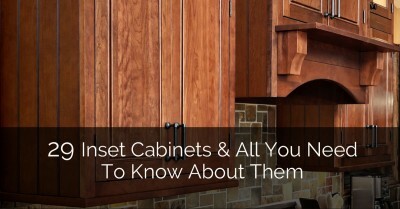 Cabinetry profiles, styles, and detailing are important to keep in mind when deciding. I wouldn’t want to steer you in the wrong direction since I don’t have enough information. 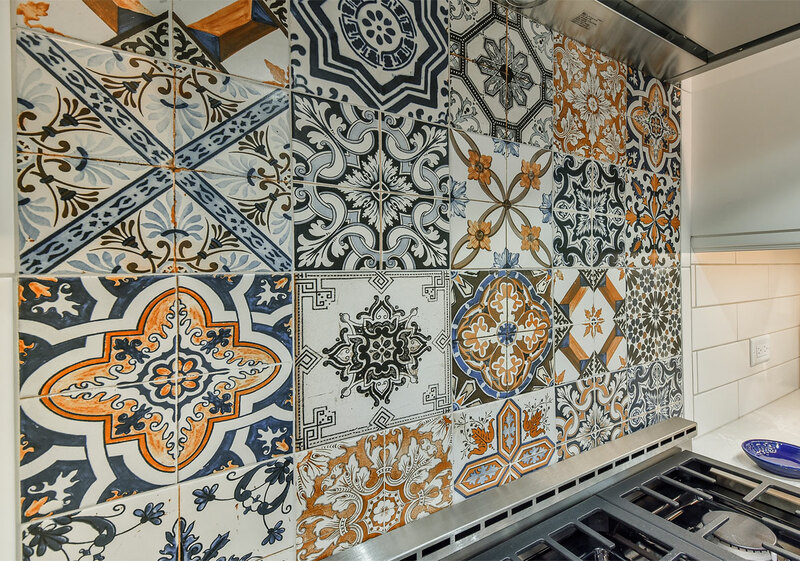 Plus, our tile distributor may have different stock & patterns than what’s available in your area. I would just take some samples tiles home to see what they are going to look like in the space. From there, I hope you should see a clear winner. Happy Shopping! What is the modern trend in relation to laminate finishes- shiny or matte? There are advantages and disadvantages to both matte and glossy finishes. Unfortunately we do not use those materials at this time. Best of luck on your project! I love this design. Thanks for sharing this amazing design and information with us. I’m needing advise on what quartz countertops should I pair with my pecan glazed cupboards . What would look timeless but elegant. Please advise. Some options would be: Zodiaq quartz: Valente Pearl, Caesarstone quartz: Cosmopolitan White, and Cambria quartz: Torquay. Hope that helps, best of luck on your project. Thanks for the valuable information regarding top trend in kitchen countertop design. While randomly browsing through the internet I also came across another website which was given good information like yours, i.e. It is also a helpful website to analyze and check which institute or top trend in kitchen countertop design. Am I right in thinking that if a countertop has a glosy finish, the splash back should not and vise versa? You can go either way because technically there are no design rules anymore! My wife and I are having a house built in Colorado. Not knowing trends or future potential value, we are having trouble deciding on what color countertop to get (white quartz or grey). We are having white cabinets installed and hard dark wood flooring. Any advice is greatly appreciated! Thank you in advance! 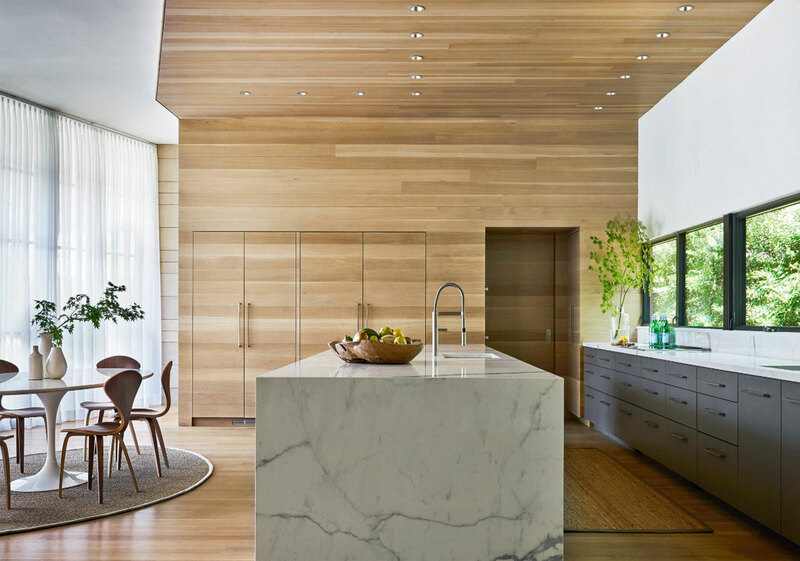 Countertops with a large veining pattern is all the rage right now. So, I would recommend combining the (2) and get a white quartz with gray veining pattern. Most brands will carry a version of this, so it shouldn’t be hard to find. Otherwise, if you are going to be there a while, then I would get what you like. Although if you are looking for a slight twist, you may want to look at Cambria Queen Anne. This is a reverse of that color combination, which might be just what you are looking for. What is the name of the quartz in #3 with the veining? It is Cambria Brittanicca, have a great day! We are selling a ton of quartz. Our customers are falling in love with what they see in the whites and grays. We are re-doing an old farm house. I love the Cashmere Carrera due to the white and some veining. I was told the quartz is the way to go now and that it will hold up. We have grandchildren and do not want to worry about spills or oils that I have read about. I am not the type of person to leave spills, everything is cleaned up fairly fast. What is your opinion on the quartz versus another type of countertop? Do you also have another countertop in mind that is just as nice. I have white cabinets with light grey walls. I would also like advice on a backsplash I have struggled with this. Our clients choose quartz more than 9/10 times these days. That said, there are some great white granite’s that are pretty beautiful as well if you are considering other options. The best advice I can give for your backsplash if you choose a countertop with a lot of movement and veining is to get something more simple (not a lot of texture or color) that way they will not overpower eachother. Best of luck on your project and have a great day! Great design and ideas. Thanks for sharing! Wow! these countertop designs are great and I’m definitely saving them for my next kitchen design. But wouldn’t it be great if the kitchen is filled with some excellent cookware? Here’s some you might like. Wow! these countertop designs are great and I’m definitely saving them for my next kitchen design. Anyway, here are some microwaves that you can buy for your newly designed kitchen. I am overwhelmed with joy and happiness to read this blog. I would like to thank you for such a wonderful post on kitchen countertops. We know that in this new era, everything has changed. Our lifestyle is sophisticated, so why not a modernized living area. Your post is truly helpful and I am very impressed with the furniture style. Thank you once again and keep posting such a blogs. Can you help me pick some colors for laminate countertops that go with a smokey taupe wood like vinyl floor & light cream with brown trim cabinets. I want something light & airy looking. Unfortunately we wouldn’t be able to provide any specifics unless you were in our showroom for this selection in person. You may want to reach out to a designer or supplier in your area to help with selections, as we do with our clients in our showroom. Have a great day! I have cherry/ walnut cabinets, larger ceramic floor tiles in pinky beige pattern and white/beige brick type backsplash. Replacing granite granite countertops. We have a huge kitchen with lots of countertop space, I like granite. Thinking of a dark wavy large veined top called “African ivory”. 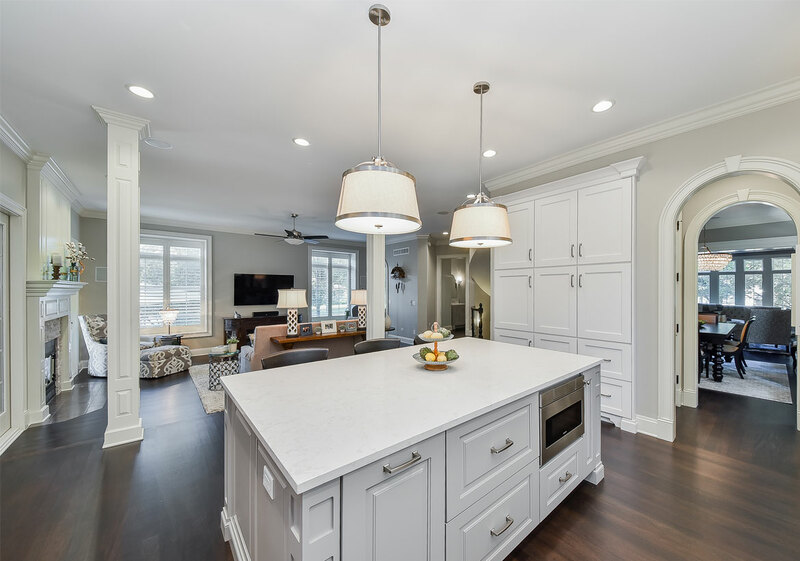 I like browns and beiges but like the pop of a darker granite counter top, my worry is that white and gray are all the rage and don’t want to make a mistake by not choosing a popular theme. I like Beiges and Browns because I think they are warm, but want a pop of bold color in countertops. Overall though… my pattern; though contemporary, will be cherry brown and beiges. Is this totally out of style. Thanks for hopefully a speedy reply since I am in process now. I’m not quite sure what “African Ivory” granite you are referring too, since stone distributors often name them differently, and we have not used that color before in a project. But my advice to you, would be if you are going to be in the house for a long time, get what you love. 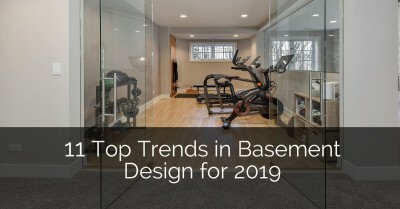 Don’t worry about the trends, especially if they don’t work for your space. I don’t know the layout, but if you have a lot of countertop space, maybe you can break it up by using (2) colors. Especially if you have an island. Then you can be bold in some places and softer in others. Either way, I would stick with the warm colors you love. Great Article! You give very clear information, both in your article and in your Q&A’s. Glad to have stumbled across your blog! I am looking at Cambrian Beaumont but am concerned the veining would be too busy on the main countertops plus large(2 tier) island. Any advice? Complementary simpler design for tops or the island? We are installing satin white kitchen cabinets with a brown greige island, what do you think of Caesar stone Nordic loft for a countertop? We have medium brown wood cabinets with white tile backsplash. Looking to install white quartz countertops. Like the Minuet and White Stratus. Any thoughts? I am glad that I discovered this website. Thank you for sharing this helpful information about countertops. I really love the articles. Keep up the good contents! I’m replacing tile counter tops with granite or quartz. The kitchen and living room flooring is slate tile. It’s old but I like it and will probably keep it for a few more years. Do you have any suggestions for granite or quartz that might work with those busy floors but still have character? Hi Shelleu, unfortunately without more info, it is hard to say what would be best. It sounds like a simple countertop may be best with the character of the floors. Good luck! Any idea of the name of countertop in picture number 5? Prepping house for resale and have cherry/ mahogany color cabinets in a galley kitchen and need to update counters. Thought I’d stick with a neutral Quartz with a marble look and subway tile backsplash and I know Cambria is higher end so want to go with something on the lesser cost spectrum. Been struggling with this for quite awhile! Suggestions? Great article.There’s a lot of useful ideas in these articles. This article is very informative and helpful. Thanks for sharing this six top trends for kitchen countertop design in 2019. This is a good concept for trending transformation. Thank you! This is very helpful and useful. Readers and contractors will find this very useful in case they need to reconstruct their kitchen countertops. I like the concept and the idea give to this blog. Looking forward to more new blogs for this year. Astonishing ideas you have mentioned above. 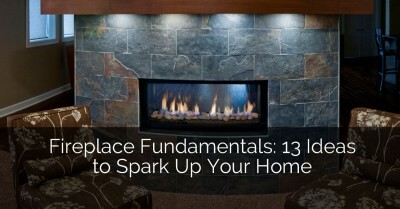 A whole list can be very informative to the homeowners who seek some professional advice.